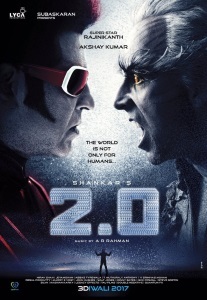 The megabudget sequel to the 2010 Tamil-language smash Enthiran brings back Rajinikanth in the dual role of Dr. Vaseegaran, government super scientist and Chitti, his AI/robot creation. All of the cell phones in Chennai have flown into the sky and coalesced into a bird-like monster. Only Chitti, Dr. Vaseegaran, and the doctor's newest robot Nila can save the city. Kind of a bummer that Aishwarya Rai was reduced to a nagging voice on the phone. But the new robot character, Nila was pretty cool. The extended flashback sequence with Pakshi Rajan stopped the movie dead in its tracks for... gosh, I don't even know how long. Twenty minutes? I kept dozing off.